Here I am, sitting at the table you see in the photograph below. The air is soft and warm already, so early in the morning, the sky blue, and we're preparing to wander out into another day. Writing ... the internet ... they are forms of meditation for me. Out here in Bourgogne, I am loving the sensations of this outdoor writing and reading life. Everyday we spend long hours wandering, exploring so there's a balance I love. 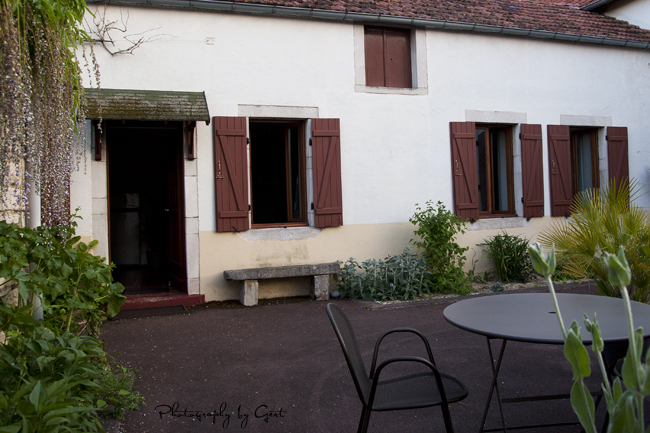 Today we're back in Beaune, tidying things up as we prepare to move closer to my beloved mountains tomorrow. I shall finally visit Mont Blanc, a mountain I read of so often in the climbing literature devoured over the years. And that is what makes leaving this little oasis of peace and beauty bearable.